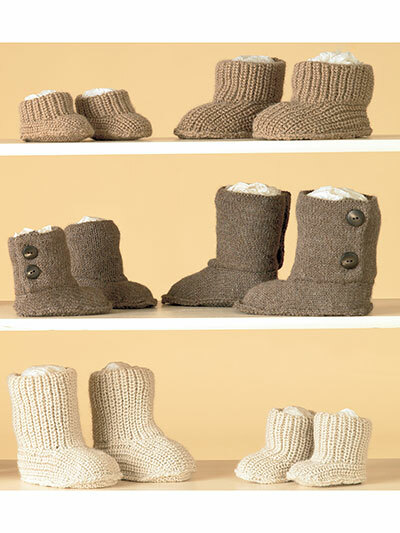 These super-cozy slippers are great for keeping your feet warm during anytime of the year! Easily customize them with cute buttons on the cuff or add other embellishments to make it truly yours. Knit with 2 (2, 3) skeins of Plymouth Yarn® Encore® Chunky using 5 U.S. size 7/4.5mm double-point needles. Cuff circumference: approximately 12 (13, 14 1/4)"
Cuff length: approximately 4 (4, 4 1/4)"
With 3 different styles to choose from -- long or short fisherman ribbed boots, or a buttoned version-- these boots are perfect to make as last-minute gifts for anyone in your life. 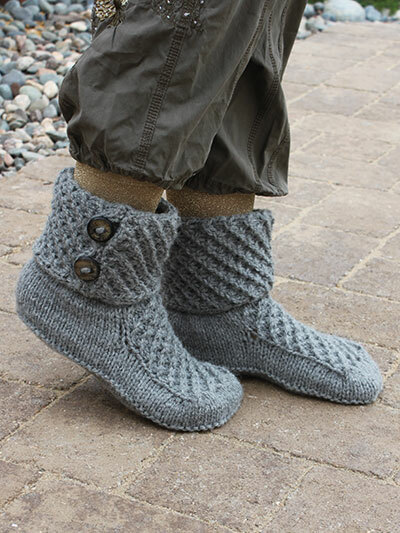 For the Long Fisherman Ribbed Slippers and Buttoned Through Slippers, knit with 1 (1, 2, 2, 2, 3) ball(s), and for the Short Fisherman Ribbed Slippers, knit with 1 (1, 1, 2, 2, 3) ball(s). All versions use #3 DK-weight King Cole Big Value DK and U.S. size 3/3.25mm needles.